It was almost dark on 11 September when General Gerow, the V Corps commander, received General Hodges' authorization for a reconnaissance in force to penetrate the West Wall.1 Thus General Gerow hardly could have expected to begin by the next morning a reconnaissance on the scale contemplated by General Collins and the neighboring VII Corps. He directed, in effect, little more than movement to assembly areas closer to the German border in preparation for the co-ordinated attack to be launched on 14 September. The plan which General Gerow had in mind for the coordinated attack on 14 September had been worked out several days earlier before General Hodges had indicated the necessity of a pause at the border.3 It reflected in some measure a basic incongruity in corps objective and mission as transmitted down the chain of command from the meeting of top American commanders at Chartres. In driving toward Koblenz, the V Corps was to attack "in conjunction with Third Army. "4 Yet if the corps tried to stick close to the Third Army, this would mean attacking up the valley of the Moselle River, a narrow compartmentalized route of advance far removed from the rest of the First Army upon which the V Corps depended for supply and for assistance in event of trouble. No one had any illusions at this stage about the terrain over which the V Corps was to attack. Already familiar were the sharp ridges, deeply incised ravines, numerous streams, dense forests, and restricted road net of the Ardennes. Attacking through the Eifel meant more of the same but with the added obstacle of the West Wall. All along the V Corps front the West Wall was a single belt of fortifications in greatest density along a possible avenue of approach southwest of the Schnee Eifel, the high wooded ridge just across the Our River and the German border. (See Map II.) Along the Schnee Eifel itself the Germans had depended so much upon the rugged terrain that they had built fewer fortifications than at any point from Aachen south and southeast to the Rhine. The objectives assigned the divisions of the V Corps were based upon three distinct elevations lying astride the route of advance. The first was the Schnee Eifel, extending unbroken for about fifteen miles from Ormont to the vicinity of the village of Brandscheid where it develops into a high, relatively open plateau. The 4th Division was to seize the crest of the Schnee Eifel to facilitate advance of the 28th Division across the plateau. Farther south the plateau is blocked by dense woods and sharp, cliff-like slopes to a point between Vianden and Echternach. Here exists a suggestion of a corridor through which the 5th Armored Division was to advance upon order to take high ground about the village of Mettendorf. The second elevation, taking the form of a high north-south plateau, lies beyond the Pruem River. At the western edge of the plateau lie the towns of Pruem and Bitburg. Though these towns have a population of only a few thousand, they are among the largest in the Eifel and are important communications centers. The infantry in the north was to take Pruem; the armor in the south, to secure Bitburg. Beyond the second elevation lies the little Kyll River, barring access to a third, high mountain-like plateau which slopes, grooved and broken, to the Rhine. Across this plateau the divisions were to make the final advance on Koblenz, some fifty miles inside the German border. Located opposite the Schnee Eifel near St. Vith, the 4th Division was about four miles south of the boundary with the VII Corps but some twenty miles from the main concentration of the VII Corps. To cover the gap, the 102d Cavalry Group was to screen and maintain contact with cavalry of the VII Corps and was to be prepared to advance eastward along the upper reaches of the Kyll through what is known as the Losheim Gap. The location of the 28th Division (minus one regimental combat team) near the right flank of the 4th Division served to effect a concentration of five regiments on a frontage of approximately fourteen miles. South of this limited concentration, the 5th Armored Division and the 28th Division's 112th Infantry were to cover the rest of the corps front of about thirty miles. As General Gerow was aware, he had achieved, for all his efforts, no genuine concentration for the attack. Yet the very fact that the corps had been assigned a rugged route of advance like the Eifel meant that American commanders still were thinking in terms of pursuit warfare. If pursuit remained the order of the day, the spread formation was acceptable, even in front of a fortified line like the West Wall. Available intelligence gave no reason for concern. 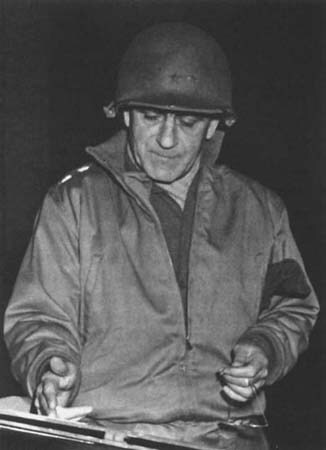 The V Corps G-2, Col. Thomas J. Ford, predicted that the corps would meet only battered remnants of the three divisions which had fled before the corps across Belgium and Luxembourg. These were the 5th Parachute, Panzer Lehr, and 2d Panzer Divisions. It was possible, Colonel Ford added, that the corps might meet parts of the 2d SS Panzer Division, known to have been operating along the corps north boundary. defend the Schnee Eifel. The remaining division, the 2d Panzer, was to guard the West Wall south of the Schnee Eifel. Between them the 2d Panzer and 2d SS Panzer Divisions could muster no more than 3 nominal panzer grenadier regiments, none with greater strength than a reinforced battalion; 2 engineer battalions; 2 signal battalions; 17 assault guns; 26 105-mm. and 3 150-mm. howitzers; plus no more than 6 tanks, 3 in each division. To this force might be added the nondescript garrison troops actually in position in the West Wall in this sector, but these were so few that they could have manned no more than every fifth position.8	General Keppler's I SS Panzer Corps formed the southern (left) wing of the Seventh Army, commanded by General der Panzertruppen Erich Brandenberger. The Seventh Army in turn formed the left wing of Field Marshal Model's Army Group B. The corps, army, and army group boundaries ran through the southern part of the V Corps zone along a line Diekirch-Bitburg. Below this line was the LXXX Corps, which was the northern (right) wing of the First Army (General der Panzertruppen Otto von Knobelsdorff) in Lorraine, which was in turn the right wing of Army Group G.
Because the German unit boundaries did not correspond to the one between the First and Third U.S. Armies, the V Corps attack was to strike the inner wings of both German army groups. Thus, northernmost contingents of the LXXX Corps also would be involved. Commanded by General der Infanterie Dr. Franz Beyer, the LXXX Corps had only one unit in this sector bearing a division label. This was the 5th Parachute Division, which, like some of General Keppler's units, had little left except a name. To a nucleus of the division headquarters and a company of the reconnaissance battalion, General Beyer had attached a security regiment, a motorized infantry regiment, and a few miscellaneous units of company size. The division had neither armor nor artillery. On 14 September, the day the V corps was to attack, the I SS Panzer Corps officially halted its retreat and began to occupy the West Wall along a forty-mile front stretching from the northern extremity of the Schnee Eifel to the vicinity of the little river village of Wallendorf, a few miles southeast of Vianden. General Keppler split the front between his two divisions, the 2d Panzer and the 2d SS Panzer.13 Already the LXXX Corps had begun to occupy the bunkers farther south. The race for the West Wall was over. Technically, the Germans had won it; but so soon were the Americans upon them that the end results looked much like a dead heat. General Gerow's plan of piercing the West Wall on a broad front with limited means could work as a genuine corps maneuver only if attended by considerable success. Because the various divisional attacks were to occur at relatively isolated points, only after attainment of unequivocal breakthrough could the divisions unite in concerted, mutually supporting maneuver. The V Corps attack thus began as three separate operations: the 4th Division on the Schnee Eifel, the 28th Division on the plateau southwest of the Schnee Eifel, and the 5th Armored Division far to the south. The first objective was the crest of the high plateau a few miles beyond the German border in the vicinity of the West Wall village of Uettfeld. The route of approach was the closest thing to a natural corridor leading into Germany in this sector, even though it consisted of steep, broken terrain served by a limited road net. Though the pillboxes here were in but one band, they were dense and fronted by an almost continuous line of dragon's teeth antitank obstacles. leading through Kesfeld to Uettfeld. The objective of Uettfeld lay about two miles beyond the dragon's teeth. General von Luettwitz might have breathed more easily had he known the true situation in the American camp. Moving directly from the scramble of pursuit warfare, the 28th Division was not ready for an attack on a fortified line. Neither of the two regiments had received special equipment needed in pillbox assault, such as flame throwers and explosive charges. Attached tank and self-propelled tank destroyer units still were repairing their pursuit-damaged vehicles and had yet to come forward. The infantry would face the West Wall with direct fire support only from organic 57-mm. antitank guns and a few platoons of towed tank destroyers, both highly vulnerable to return fire. Few units of the division had more than a basic load of ammunition, enough perhaps for a meeting engagement but not for sustained fighting. So concerned about the ammunition shortage was the division commander, General Cota, that he forbade unobserved artillery fires except previously registered concentrations and others specifically approved by his headquarters. In addition, both regiments of the 28th Division would be restricted for still another day to committing but one battalion to action. tomland. At heavy cost the regiment finally seized a strip of forward pillboxes more than a mile wide but fell short of taking Roscheid. Two miles to the north, the 110th Infantry renewed the attack toward Kesfeld while sending a battalion around to the north through the village of Heckhuscheid to move southeast on Hill 553, a West Wall strongpoint along the Heckhuscheid-Uettfeld highway. Once again the regiment found that without direct fire support the infantry could make no headway against the pillboxes. The battalion southeast of Heckhuscheid found the way barred by dragon's teeth and a roadblock at the base of Hill 553 and could get no farther. Though the battalion near Kesfeld had tried during the night to bring up explosives to blast a path through the dragon's teeth for tanks, the explosives had blown up unexplainably and killed the men who were carrying them. Arriving in midmorning, the tanks could provide little assistance because they could not get past the dragon's teeth and because poor visibility restricted fire against distant targets. Advance might have been stymied indefinitely had not 2d Lt. Joseph H. Dew maneuvered his tank to within a few feet of the dragon's teeth and methodically blasted a path with his 75-mm. gun.19 Accompanied by the tanks, the infantry managed to seize a tiny foothold within the forward band of pillboxes, but at severe cost in casualties. From prisoners, both regiments learned something of the desperation with which the Germans had tried to man the West Wall. Many pillboxes, prisoners revealed, still were unmanned, and others contained only two or three men armed with rifles and an occasional machine gun or panzerfaust. Gathered from almost every conceivable source, many of the men had arrived in the line only the night before. Complaining bitterly about having to fight, a forty-year-old cook said he was captured little more than two hours after reaching the front. Though the 28th Division's gains were meager, they looked different when viewed against the backdrop of the situation along the entire corps front. Seeing the first punctures of the line as the hardest, the V Corps commander, General Gerow, ordered the 5th Armored Division to send an officer that night to advise the 28th Division on use of armor in event of a breakthrough the next day. The 5th Armored Division's Combat Command B, located northwest of Diekirch, was ready to move through if the infantry forged a gap. vain to get past Roscheid and secure a hill that provided damaging observation off the regiment's right flank. In the process, the enemy's 2d Panzer Division gradually chewed the regiment to pieces. Battered by German shelling, the American riflemen could not be trusted to hold the positions already gained. In at least two instances they fell back in panic before limited objective counterattacks. So poor was the showing that General Cota subsequently relieved the regimental commander. Through most of 15 September the situation in the 110th Infantry's sector appeared equally discouraging. The 1st Battalion, commanded by Lt. Col. Floid A. Davison, was to try again to take Hill 553; but the late arrival of tanks and of engineers equipped with explosives to blow the troublesome roadblock precluded early success. Not until 1700 did the engineers arrive. The plan at this point was for the engineers to advance to the roadblock under cover of fire from the tanks and a platoon of towed tank destroyers. Blowing of the roadblock was to signal the start of an attack by infantry and tanks. Ten unarmed engineers, each carrying a 50-pound load of TNT, began to creep slowly, carefully toward the roadblock. Though the day was foggy, the engineers felt naked. As they inched forward, tension mounted, passing almost electrically to the waiting infantrymen and tankers. Reaching the objective at last, the engineers found that the roadblock consisted of six steel I-beams emplaced in concrete caissons on either side of the road. Large portable iron tetrahedrons reinforced the whole. Working swiftly, they placed their charges. Shortly after 1830, an hour and a half after start of the tedious journey, the engineers completed their work. Activating the charges, they jumped to their feet. In the words of their lieutenant, they "went like hell to the rear." The roadblock disintegrated with a roar. Acting on cue, the tanks fired pointblank at the pillboxes. The infantry went forward on the run. In about forty-five minutes the battalion had stormed the objective, Hill 553. It yielded seventeen pillboxes and fifty-eight prisoners. After almost three days of mounting casualties and frustrations, the 110th Infantry in a quick, coordinated assault at last had gained a significant objective within the West Wall. The regimental commander, Colonel Seely, planned for his two committed battalions to converge the next day upon the regimental objective of Kemper Steimerich Hill (Hill 560), key to the commanding ground around Uettfeld. In order to better the jump-off position and to narrow a gap between the two battalions, the fatigued battalion west of Kesfeld sent a company in late afternoon to clear a nest of pillboxes in the direction Of Hill 553. As darkness came, Company F under Capt. Robert H. Schultz completed the mission. Sending back more than fifty prisoners, the men began to settle down for the night in and about the pillboxes they had captured. A few minutes after the firing began, another company intercepted a frantic radio message: "KING SUGAR to anybody. KING SUGAR to anybody. Help. We are having a counterattack—tanks, infantry, flame throwers." What could anybody do to help? By the time the messages could be exchanged and artillery brought to bear, the action had subsided. Company Fs radio apparently was defective, capable of sending but not of receiving. The situation thus was so obscure that Colonel Seely dared not risk immediate commitment of his reserve. What happened remained a mystery difficult to piece together from the fragments of information provided by the few men who escaped. The Germans apparently had attacked with about seventy to eighty men reinforced by two flame-throwing vehicles. A prisoner captured some days later said the vehicles were improvised flame throwers constructed from Schuetzenpanzerwagen (armored half-tracks). As late as two days after the event, Company F could muster no more than forty-four men, including cooks and supply personnel. The news of Company Fs disaster dealt a heavy blow to the optimism engendered by the success of the preceding afternoon. Only a few hours before the Germans hit Company F, General Cota had expressed "high hopes" about the division's prospects.22 He could have been thinking only of the 110th Infantry, which now would have to use its reserve battalion to retake the pillboxes Company F had lost. Delayed again by the late arrival of supporting tanks and unassisted by the rest of the regiment, Colonel Davison's 1st Battalion nevertheless attacked again in midmorning of 16 September. Assisted by effective counterbattery artillery fires, the battalion quickly seized Losenseifen Hill (Hill 568), adjacent to Hill 553 and one of the highest points in the 28th Division's sector. Leaving a company to hold the hill, the 1st Battalion continued to attack and stopped for the night only after capturing Spielmannsholz Hill (Hill 559), less than a thousand yards short of the regimental objective overlooking Uettfeld. In a day of rapid, determined advance, Colonel Davison's men had progressed a mile and a half past the dragon's teeth and had captured some of the most commanding ground for miles around. Beyond them lay only scattered West Wall fortifications. Though the penetration was narrow and pencil-like, the 28th Division had for all practical purposes broken through the West Wall. bringing troops from some other part of the front. During the next few days, the 109th and 110th Infantry Regiments jockeyed for position, while the Germans registered their protest with small counterattacks and continued shelling.24 The attempt to get across the high plateau into the rugged Eifel was over. General Barton ordered the 12th and 22d Infantry Regiments to attack abreast at 1000 on 14 September to seize an ambitious objective, commanding ground on the crest of the central plateau beyond the Pruem River, more than 10 miles away.27 The 8th Infantry (Col. James S. Rodwell) was to remain in division reserve. Commanders of the two forward regiments designated initial objectives astride a lateral highway that follows the crest of the Schnee Eifel. These regiments also were to protect the division's exposed flanks, for to the southwest, closest units of the 28th Division were more than four miles away, and to the northwest, the closest friendly troops, except for a thin veil of cavalry, were twenty-five miles away. ing the two preceding days. Although the regiments had intended to attack together, the 22d Infantry was delayed until noon while awaiting arrival of an attached company of tanks and then used, according to plan, but one infantry battalion. The 12th Infantry intended to employ two battalions, but one took a wrong trail upon entering the forest and contributed little to the day's action. Thus the 4th Division attacked on 14 September in no greater strength at first than the 28th Division had employed the day before. Screened by a drizzling rain, the 12th Infantry on the left advanced virtually unimpeded up the steep western slopes of the Schnee Eifel. The only battalion to make actual contact with the West Wall found the pillboxes undefended. Cutting the Schnee Eifel highway without difficulty, the battalion turned northeast along the highway toward the wooded high ground of Bogeyman Hill (Hill 697, the Schwarzer Mann). Only here did the battalion encounter a defended pillbox. Accompanied by tanks, the infantry moved along firebreaks and trails to outflank and carry the position. The men dug in for the night on Bogeyman Hill, all the way through the fabled West Wall. Resistance had been so light that the infantry had called only once for supporting artillery fire. A mile to the south, the leading battalion of the 22d Infantry had been nearing the woods line east of Bleialf when a round from an 88-mm. gun ripped into one of the accompanying tanks. As the crewmen piled from the tank, the other tanks maneuvered about on the open hill. Thinking the tanks were withdrawing, the riflemen began to fall back in a panic. The attack might have floundered on this discreditable note had not unit commanders acted aggressively to bring the men under control.28 Then, as if to atone for their earlier hesitancy, the men charged forward at a run. In about twenty minutes their charge carried not only to the woods line but past a row of pillboxes all the way to the crest of the ridge. Like the 12th Infantry, the 22d Infantry had achieved an astonishingly quick penetration of this thin sector of the West Wall. To enlarge the penetration, the regimental commander, Colonel Lanham, quickly committed his other two battalions. One continued the drive to the east to gain the woods line on the eastern slope of the ridge while the other joined the assault battalion in fanning out to right and left to roll up the line of pillboxes. Some of the fortifications turned out to be undefended, and the enemy had manned the others predominantly with middle-aged men and youths who had little unit organization and less conception of tactics. One or two rifle shots against embrasures often proved persuasion enough to disgorge the defenders, hands high. Only to the southwest at a crossroads settlement on the Bleialf-Pruem highway did the Germans fight with determination, and here close-in fire from self-propelled tank destroyers had a telling effect. By the end of the day the 22d Infantry held a breach in the West Wall about two miles wide. One battalion had reached a position on the eastern slopes of the Schnee Eifel overlooking the village of Hontheim, a mile and a quarter past the forward pillboxes. DRAGON'S TEETH near Brandscheid. The wooded section at upper left is the edge of the Schnee Eifel. the 5th Armored Division to advise the 28th Division on the use of armor in event of a breakthrough. Though the greatest success had been in the 4th Division's sector, the terrain along the Schnee Eifel discouraged use of armor there. With the 8th Infantry on 15 September rode General Barton's main hope for a breakthrough. If the 8th Infantry could push rapidly, the Schnee Eifel could be outflanked and the West Wall left far behind. The difficulties of terrain were nowhere more evident than in the center of the 4th Division's formation where the 8th Infantry began to drive down the wooded eastern slopes of the Schnee Eifel early on 16 September. By nightfall the next day parts of the regiment were near the eastern edge of the forest; but behind them lay hundreds of yards of dense woods crossed only by muddy, poorly charted firebreaks and trails subject to constant enemy infiltration. On the division's south wing, the 22d Infantry could attribute a lack of success against the village of Brandscheid to the backbone which West Wall pillboxes put into the German defense. The only bright development on this part of the front came in the afternoon of 16 September when the 1st Battalion pushed out of the Pruem State Forest to seize a hill that commanded the Bleialf-Pruem highway a few hundred yards west of the German-held village of Sellerich. Even this achievement was marred by the loss from German shelling of some thirty-five men wounded and eight killed, including the battalion commander, Lt. Col. John Dowdy. vance, the 22d Infantry commander, Colonel Lanham, ordered continuation of the attack the next day to pass beyond Sellerich and seize high ground east of the Mon creek on the road to Pruem. Commanded now by Maj. Robert B. Latimer, the 1st Battalion faced terrain that tended to funnel its attack dangerously. In front of the battalion were three villages: Hontheim, on high ground to the northeast; Herscheid, on high ground to the southeast; and Sellerich, along the main highway in a depression exposed to the dominating ground on either flank. Because Major Latimer deemed his strength insufficient for taking the high ground, he saw no alternative to attacking directly down the valley. Recognizing the danger in this approach, he requested artillery fire to blanket the high ground and directed only one company to move at first to the objective. Company A was to take the objective, Company B was to follow soon after with attached tank destroyers and tanks to help hold the objective, and Company C was to maintain the jump-off positions west of Sellerich. Even before the attack began, adversity overtook the 1st Battalion. Into the morning of 17 September enemy shelling so unnerved several officers, including the commander of the attached tank platoon, that they had to be evacuated for combat exhaustion. About 0830, as Company A moved to the line of departure, another severe shelling so upset the company commander that he too had to be evacuated. 1st Lt. Warren E. Marcum assumed command of the company. Still under German shellfire, Lieutenant Marcum and Company A moved quickly down the highway into Sellerich. They found not a single German in the village and continued unopposed across the Mon creek. By 1100 they had occupied the crest of the objective, Hill 520. When Company B and the tanks and tank destroyers started to follow, one of the tank destroyers hit a mine in the deeply incised ravine of the creek. Almost immediately the Germans came to life. Opening fire with antitank weapons from both north and south, they drove the armor to cover in Sellerich. With interlocking fires from machine guns and light caliber antiaircraft weapons, they sealed off the route of retreat. Mortar and artillery fire rained upon the trapped troops. East of the creek, about a hundred Germans began to counterattack Company A from two directions. Try as they would, Company B and the tanks could not cross the ravine to Lieutenant Marcum's aid. Fearful of losing the hill west of Sellerich, Major Latimer was reluctant to commit his remaining company. To make it available, Colonel Lanham called off an attack at Brandscheid to send tanks and a rifle company to hold the hill; but by the time this force could disengage, the situation at Sellerich and beyond the creek had so deteriorated that reinforcement appeared futile. Only minutes before Lieutenant Marcum was wounded, he requested permission to withdraw. Then his radio ceased to function. By the time Major Latimer got a decision from the regimental commander authorizing withdrawal, he had no communications with Company A. Although he sent two messengers forward, he could see no evidence that they reached the company. When the battalion S-3 tried to get forward, he was wounded five times. For the next few days all three regiments of the 4th Division were to engage in local attacks to adjust their lines for defense, but they registered no major gains. The battle was over. Neither Germans nor Americans possessed either the strength or inclination to push all out for a decision. In four days of combat ranging from light to intense, the 4th Division had torn a gap almost six miles wide in the West Wall but at a point offering no axial roads and few objectives, short of the Rhine, attractive enough to warrant a major effort to secure them. The breach had cost the division about 800 casualties. Four major factors had worked against both the 4th and 28th Divisions in making the V Corps main effort. First, the cruel terrain and the West Wall had enabled a few Germans to do the work of many. Second, rain and generally poor visibility had denied air support, restricted observation for tank and artillery fires, and produced poor footing for tanks. Third, a shortage of artillery ammunition, which in the case of the 28th Division had limited artillery units to twenty-five rounds per gun per day, had denied the infantry large-scale fire support and had afforded German guns an immunity that otherwise would not have existed. Fourth, an inability to concentrate had prevented either division from employing overwhelming weight at any critical point. The last factor had affected the 28th Division particularly, for General Cota had possessed no reserve regiment. First Army commander, had been distinctly conservative in his authorization. Hodges, for example, had insisted that "all troops should stay tightly 'buttoned up,' " and Gerow had received a "definite impression" that the army commander would not sanction the corps becoming "involved" in the West Wall before 14 September.37 Even had the infantry divisions achieved a coup de main, might they not in exploiting it have encountered similar difficulties? Indeed, in view of the ammunition shortage and the dispersion of units, they might have had trouble even holding a major breach of the West Wall. From the viewpoint of both the V Corps and the Germans, the main effort by the infantry divisions actually had shown less promise of far-reaching results than had another attack in the south of the V Corps zone. Here an anticipated secondary effort by the 5th Armored Division had developed into a genuine opportunity for a breakthrough which showed promise of welding the three separate division actions into a cohesive corps maneuver. Observers in posts along the Our and Sauer Rivers, which separate Luxembourg from Germany, and patrols that probed the West Wall brought back similar reports: In some places the pillboxes were not manned; in others the Germans were hurriedly moving in. Though the Americans did not know it, this was the sector of the great gap between the I SS Panzer Corps and the LXXX Corps, which was perturbing both enemy corps commanders, Generals Keppler and Beyer. In the afternoon of 13 September, as the infantry divisions in the north closed to the West Wall, CCR conducted a reconnaissance by fire near the village of Wallendorf, about halfway between Echternach and Vianden. It failed to provoke a single return shot from the Germans. was to attack through Wallendorf to seize high ground near Mettendorf, about five miles inside Germany, and then drive to Bitburg, twelve miles beyond the border. The 1st Battalion, 112th Infantry, was to assist the attack. In directing an attack between Vianden and Echternach, General Gerow had exercised a choice between two existing avenues of approach into Germany in this region. One extends northeast from the vicinity of Wallendorf, the other almost due north from an eastward bend in the German border east of Echternach. Though the Wallendorf corridor is more sharply compartmentalized and has fewer good roads, General Gerow chose it because it was somewhat closer to the infantry divisions (about fifteen miles). General Oliver decided to attack from the southwestern corner of the Wallendorf corridor at the village of Wallendorf itself. Here his right flank might hug the Nussbaumer Hardt, a great forest barrier, leaving room for later broadening of the base of the penetration to the northwest and north. Though the ground rises so abruptly beyond Wallendorf that it reminded some men of the Palisades on the Hudson, similar heights bar the way all along the entrance to the corridor. CCR knew little about the enemy situation across the border except what patrols and observers had discerned in the preceding three days. A number of patrols, including that of Sergeant Holzinger on 11 September at Stalzemburg, about eight miles northwest of Wallendorf, had encountered no opposition. Reports indicated that water seepage filled some pillboxes and that dust blanketed the inside of others; but on 12 and 13 September observers had noted a few German soldiers entering the pillboxes. In light of the true German situation, the choice of the Wallendorf sector for an attack was fortunate. It was on the extreme right of the LXXX Corps, the weakest point in General Beyer's defenses. Not until the morning of 14 September, when the hastily recruited Alarmbataillon arrived from Trier, did any organized unit take over the sector. About two miles north of Wallendorf lay the boundary not only between the two enemy corps but also between the First and Seventh Armies and between Army Groups B and G. A certain element of divided responsibility was bound to exist.39 As for the West Wall itself in this sector, it was markedly thin because German engineers had leaned heavily upon the rugged nature of the terrain. Although all bridges near Wallendorf had been demolished, the river is only about forty yards wide and at this time of year fordable at a number of points. The status of supply in the 5th Armored Division was similar to that in the rest of the V Corps, although the logistical pinch might not be felt so severely since only one combat command was to see action. The three-day pause in Luxembourg had enabled the division to refill its fuel tanks and constitute a nominal gasoline reserve. Although artillery ammunition on hand was no more than adequate, a shortage of effective counterbattery fires in the coming offensive was to arise more from lack of sound and flash units and from poor visibility than from any deficiency in ammunition supply. 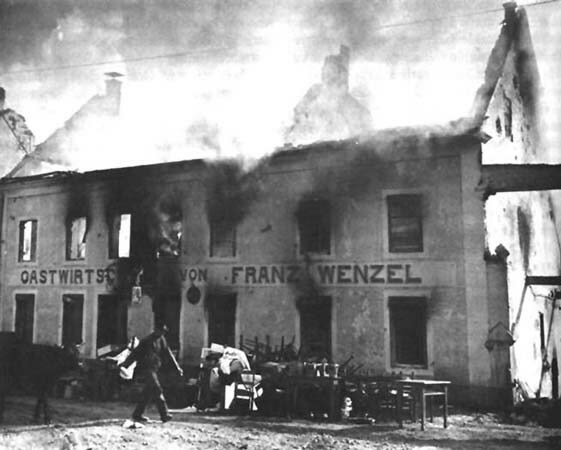 WALLENDORF CIVILIANS strive to save their belongings from the burning town after German troops have left. Continuing past Wallendorf, tanks and infantry of CCR knocked out lightly defended pillboxes to gain a firm foothold astride the first high ground, a promontory of clifflike terrain between the Sauer and the sharply incised Gay creek. As darkness came, the only exit the troops could find leading off the high bluff into the Gay gorge was blocked by a big crater. Awaiting results of further reconnaissance for another route, the tanks and armored infantry laagered for the night. The armor temporarily stymied by the blocked road, Colonel Anderson ordered the attached 1st Battalion, 112th Infantry, commanded by Lt. Col. Ross C. Henbest, to take up the attack. Colonel Henbest's infantry was to seize Biesdorf, a village beyond the Gay creek, capture of which should facilitate CCR's efforts to get off the high bluff the next morning. Unfortunately, the infantry lost direction in the foggy darkness and wandered aimlessly through the night. Having discovered another road leading north to span the Gay creek at Niedersgegen, the armor resumed the advance the next morning, 15 September. At the creek the combat command ran into an understrength company of Mark IV tanks supported by a scattering of infantry. In a noisy but brief engagement, the American gunners accounted for 3 enemy tanks and 6 half-tracks and sent 5 other tanks scurrying to the east. CCR's only loss came later when a wooden bridge over the Gay collapsed under the weight of a Sherman tank. The column crossed nearby at a spot that later came to be known by the dolorous name Deadman's Ford. These two German units actually could do little more than harass CCR with a succession of small pinprick thrusts.43 Pushing northeast and east from Niedersgegen, CCR moved virtually unopposed. In rapid succession the armor seized four villages and occupied Hill 407, the crest of the high ground near Mettendorf, the initial objective. Already CCR had left all West Wall fortifications in its wake. One column continued east and northeast and at dusk was nearing the village of Bettingen on the west bank of the Pruem River when German antitank guns suddenly opened fire. Forced back in confusion by the unexpected resistance, the column withdrew a few hundred yards into the villages of Halsdorf and Stockem to await daylight before coming to blows with the German gunners. conceived an audacious scheme to assist his infantry divisions and reopen his front. He told General Oliver first to seize Bitburg, then to swing north on main roads to Pronsfeld and Pruem. This would place the armor squarely in rear of the enemy opposing the 28th Division and relieve the south flank of the 4th Division. The corps cavalry was to take over a portion of the 5th Armored Division's Luxembourg front to free another combat command, CCB, for the maneuver. The plan involved advances of from fifteen to thirty miles by two columns, parallel to, but deep behind, the enemy front. By shuffling troops in another corps, Knobelsdorff at First Army at last managed to put his hands on a reserve to send the LXXX Corps. He released a regimental combat team of the 19th Volks Grenadier Division, which began moving north by truck during the night of 15 September. The rest of the division, minus one regiment, followed two days later. In yet another move, Knobelsdorff reduced the corps sector by ordering the adjacent corps to take over the southern wing of the LXXX Corps front.45	In the meantime, while the Germans had been making these frantic moves and while CCR had been recording its rapid advance, Colonel Henbest's 1st Battalion, 112th Infantry, had renewed the attack against Biesdorf. The battalion cleared the town by late afternoon of 15 September. On orders from the CCR commander, Colonel Anderson, the infantry then moved about two miles farther to assume positions protecting the southeast flank of the armor near the settlement of Stockigt. Organic engineers at the same time were constructing a treadway bridge across the Sauer at Wallendorf. Late in the day the attached 254th Engineer Combat Battalion began construction of a wooden trestle bridge. Upon arrival of the engineer battalion, the organic engineers moved forward to begin demolition of captured pillboxes. At dusk (16 September) an engineer reconnaissance party investigating the Gay creek crossing at Niedersgegen ran into enemy small arms fire near Deadman's Ford. Two engineers were killed. The experience presaged the fact that the Germans were going to do something about CCR's penetration, for this was the first example of what was to become a continuing difficulty with German infiltration into the undefended flanks of the penetration. next day's advance on Bitburg. When the 95th Armored Field Artillery Battalion tried to cross the Gay creek at Deadman's Ford, the column came under machine gun and mortar fire from the north. Though the CCR commander, Colonel Anderson, sent back a married platoon of infantry and tanks from Hill 407 to clean out the opposition, the force failed to reach the creek. On the way, about midnight, the lieutenant in charge came upon a portion of the combat command supply trains that had avoided the enemy fire by cutting cross-country south of Deadman's Ford. Because the lieutenant knew that the trains usually followed the artillery, he assumed that the artillery already had passed and that the ford was clear. As a result, the opposition was not eliminated until the next day, 16 September, and soon thereafter German tanks appeared to interdict the stream crossing. Not until late on 16 September did all the artillery get into firing positions east of the Gay creek. The Germans hardly could have touched CCR at a more sensitive spot. Through most of 16 September Colonel Anderson held in place, wary of racing east with the armor until the artillery could get forward. By the time the big guns were ready to fire, a heavy fog had closed in and darkness was approaching. Enemy artillery had been moving up all day and had begun to shell CCR with disturbing accuracy. When the task force at Halsdorf and Stockern did launch an attack in late afternoon, the enemy near Bettingen proved to have lost none of his tenacity or fire power from the night before. The attack faltered almost immediately. Infiltration at Deadman's Ford and a lieutenant's error thus had cost CCR any advance on a day when every effort should have been made to exploit the penetration. As it was, only Colonel Henbest's 1st Battalion, 112th Infantry, gained any ground on 16 September. The infantry moved from Stockigt through Stockem, eastward to the Pruem River at Wettlingen. Pushing quickly across the little river in the face of heavy shelling and small arms fire, the infantry by nightfall had seized high ground several hundred yards northeast of Wettlingen. Supported by a self-propelled tank destroyer platoon, Colonel Henbest's battalion had reached a point only five miles from Bitburg. patrols to develop the enemy situation in the vicinity of Bitburg. The armor was also to "mop up" the West Wall north and northeast of Wallendorf but was to make no attack on Bitburg except on corps order. General Gerow's directive meant, in effect, that the 5th Armored Division was to assume the defensive. It must have come as a shock to both troops and commanders. That the Germans had not stopped the V Corps armor was plain. The first real adversities to come in the Wallendorf sector hit after the issuance of this order. The explanation for the halt appeared to lie instead in the decisions that had emerged from the meeting of General Eisenhower and his top commanders on 2 September at Chartres and in a critical over-all logistical situation. In commenting later on the reasons for calling off the 5th Armored Division's attack, General Gerow explained the halt of all three of his divisions.47 The plan, General Gerow said, had been agreed upon by General Hodges and himself. It was to have been an "investigation" proceeding to the ambitious objectives if resistance proved "negligible." When defense actually proved "so stout," the First Army had instructed the V Corps "not to get too involved." The fact was that the V Corps had been operating on borrowed time and borrowed supplies. The presence of the corps this far east was attributable only to the fact that General Hodges had deviated from the Chartres instructions, giving the V Corps some of the limited gasoline available rather than assigning all of it, as directed, to the other two corps next to the British. 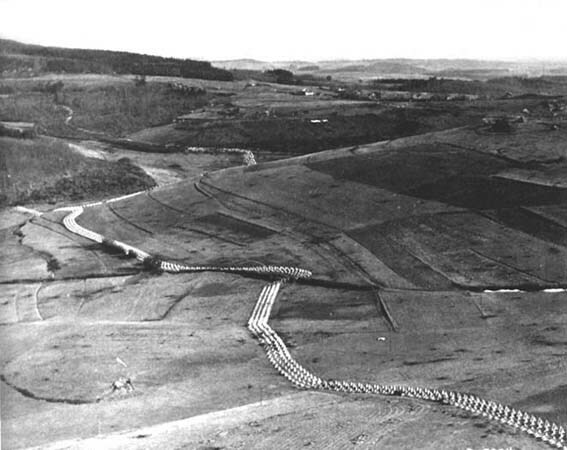 Although Hodges had done this with an eye only to the limited objectives of closing the gap between the First and Third Armies and getting the V Corps across the obstacle of the Meuse River, he must have been reluctant to abandon without at least a trial the splendid opportunity which had developed to put the obstacle of the West Wall behind in the same jump. Under the circumstances he could have countenanced continued logistical priority for the V Corps only if far-reaching successes could have been had for the asking. Though the V Corps obviously could have continued the advance, it would have taken some fighting to achieve it, no matter how makeshift the units with which the Germans had shored up the West Wall in the Eifel. Lamenting the basic failure of these countermeasures, the Commander in Chief West, Rundstedt, believed they might have succeeded had they been directed not at the tip of the salient but at the flanks close to the base at Wallendorf.51 Though Rundstedt's criticism was largely justified, the Germans nevertheless had used much of their strength to prevent the newly arrived CCB from expanding the base of the salient appreciably. In many instances, after pillboxes were taken, the Germans had infiltrated back into them. Unaware that the Americans had called off their attack, Rundstedt and the other German commanders saw the situation as extremely serious. Late on 17 September Rundstedt gave Army Group B a reserve panzer brigade, the 108th, for employment under the 2d Panzer Division against the north flank of the bridgehead. At the same time, General von Knobelsdorff at First Army laid plans to commit the 19th Volks Grenadier Division in a counterattack against the south flank on 18 September. The LXXX Corps commander, General Beyer, directed the 108th Panzer Brigade to hit the main positions of CCR on Hill 407 from the north while the infantry units supported by the remnants of the Panzer Lehr attacked from the south. Unfortunately for the Germans, the Americans were ready, and a fortuitous break in the weather made possible the first major contribution by U.S. air since the crossing of the border. Knocking out ten German tanks, CCR sent the enemy armor and infantry reeling back from Hill 407 in disorder. Adjusted from a light observation plane, American artillery followed the retreat. Taking quick advantage of the clearing weather, two squadrons of P-47 Thunderbolts of the 365th Group took up the fight. The air strike was so effective that the First Army subsequently sent the squadron leaders54 a special commendation. German artillery, which by this time had begun to fire on the bridgehead from almost every direction, eluded the pilots until the next day when the "enemy caught hell." About fifty planes of the 365th Group participated on 20 September, primarily against German tanks and artillery. The artillery included a number of big railroad guns, of which the pilots claimed to have destroyed four. The armored troops rewarded the fliers with a' laconic: "They sure do a fine job; thanks." Heavy shelling and ground pressure continued against the reduced bridgehead. Despite relentless attacks by the same German units that had opened the drive on 19 September, CCB gave no ground except according to plan. Then, in late afternoon of 21 September, the V Corps at last gave approval to abandonment of the bridgehead. In pulling back across the Sauer before daylight on 22 September, CCB had to use the ford which the first troops to cross the river had employed eight days before. During the preceding night the Germans once again had penetrated to the Wallendorf bridges. In reporting the situation after having driven off this second infiltration, CCB had made a notable use of understatement. "Only change," the combat command had reported, "[is] both bridges blown." Under General Brooks, the divisions of the V Corps rotated their battalions in the line while the corps staff worked on proposed plans for relief of the corps and a lateral shift to the north. In the meantime, the Ardennes-Eifel front lapsed into a relative quietness that was to prevail until December.